Activities in the kitchen have always been my escape. Be it stress, frustration, sadness, or anger– baking has been a sure solution that brings me back to sanity and normalcy. Some people like to get massages, play golf, or watch a movie to unwind. I bake. 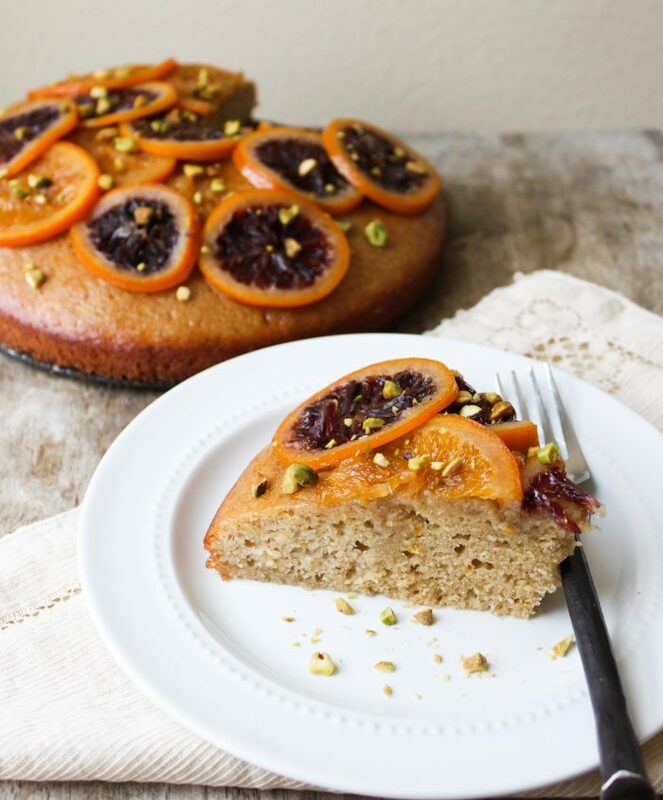 This candied blood orange olive oil cake reminds me of my stay in Italy last summer. My boyfriend and I toured the southern part of the country, starting in Rome and making our way down to Sicily, Naples, Pompeii and Positano. Blood orange was sold everywhere in all sorts of form–juice, granita, sorbetto, baked goods. One thing that really stood out while I was there was the country’s sense of time. Life seems more leisurely; it was enjoyed at a slower pace. Alex and I enjoyed lunches that took all afternoon, dinner that lasted until the wee hours of the morning, and strolls around the streets at a snail’s pace. I took in all the scenery, breathed in the salty air by the ocean, and not once did I bother to check my watch (or cell phone clock). Maybe it was because I was on vacation, but the feeling and state of mind that I experienced abroad is one I like to revisit during unpleasant times. From what I observed, people just loved to relax, spent time with friends and family socializing and talking. I enjoyed Italy so much that I will be returning this summer for my birthday. This year, we will be touring the northern parts of Italy. Alex and I will be traveling to Milan and Cinque Terre. I am more than excited. I spent the better half of Monday thinking about life; about struggles, challenges, daily routines, and choices. I thought about the importance of family, love, and hope. What is the value of today? We live in a fast-paced world where quick fixes and easy solutions are preferred. Sometimes, we need to choose to do things that cannot be done in hurry. This is an involved cake that takes time and patience. It is not a one bowl cake or a five ingredient or less fix. Although this cake was a lengthy process, it helped me calm down, slowed time, and kept me at peace all afternoon. And of course, the cake is molto delizioso! I made this olive oil cake on Monday after I heard about the sudden passing of my uncle. May his soul rest in peace. He will be missed and continues to be loved. In a medium heavy-bottomed saucepot, combine sugar, water, honey, and cinnamon bark/sticks. Bring to a boil over high heat. Stir until sugar dissolves. Once syrup has come to a boil, add orange slices. Reduce heat to low and let simmer for 30-40 minutes until orange slices are tender and syrup is fragrant. Remove orange slices and transfer to parchment lined sheet tray. Arrange slices in a single layer. Allow to cool. Strain syrup and let cool. Separate one cup of syrup for orange soaking syrup. Keep remaining syrup for serving. 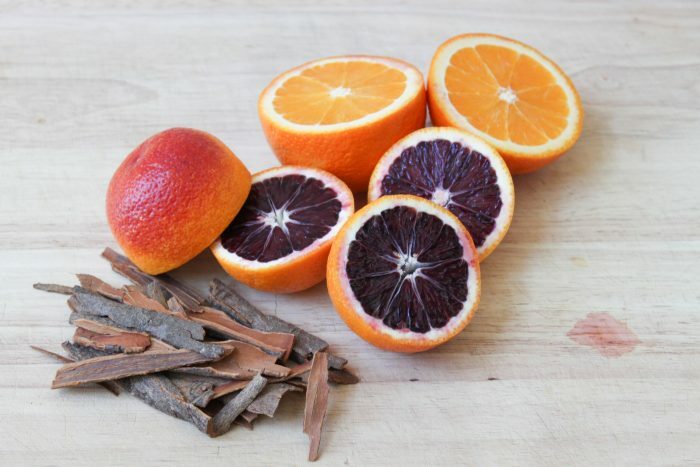 Reserve 1 cup of syrup from candied blood orange. Mix in 2 tablespoons of Grand Marnier liquor. Preheat oven to 350 degrees F. Lightly coat 9-inch springform pan with olive oil. Set aside. In a medium bowl, whisk together AP flour, semolina flour, baking powder, baking soda, salt and ground cinnamon. In large bowl, whisk together 1/4 cup sugar and olive oil. Add in egg yolks and whisk until combined. Using a spatula, fold in dry flour mixture in two additions. Fold in milk and orange zest. Using an electric mixer, beat egg whites using a whisk attachment until foamy. Slowing add in remaining 1/4 cup sugar and beat until firm peaks. Fold egg whites into cake batter in two additions. Transfer to prepared pan. Smooth top using a mini offset spatula to level batter. Bake for 20-25 minutes until cake is set and a toothpick inserted into center comes out clean. Using a toothpick or the tines of a fork, pierce the cake all over. Slowly drizzle 1/2 cup of orange syrup over the cake. When the syrup is absorbed, about 5-10 minutes later, pour another 1/2 cup of orange syrup over the warm cake. Leave cake to cool in pan. Once cake is at room temperature, release cake from cake. 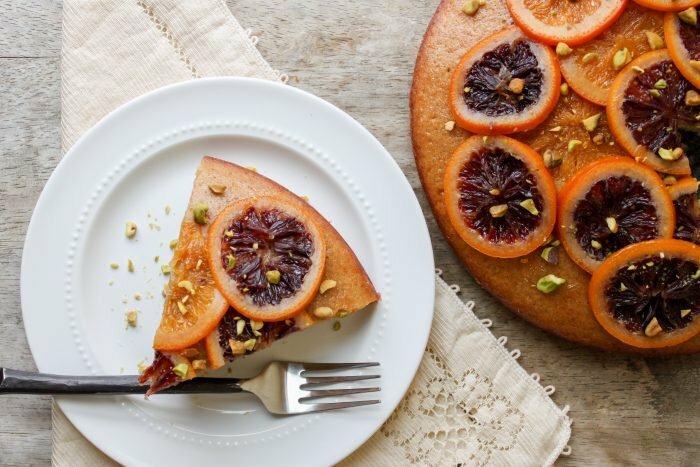 Place candied orange slices over the cake. Sprinkle pistachios. Cut into servings and serve with additional orange syrup. It is better to have more orange slices than you think you will need. Some slices will break apart during cooking. You will also end up snacking on some slices. 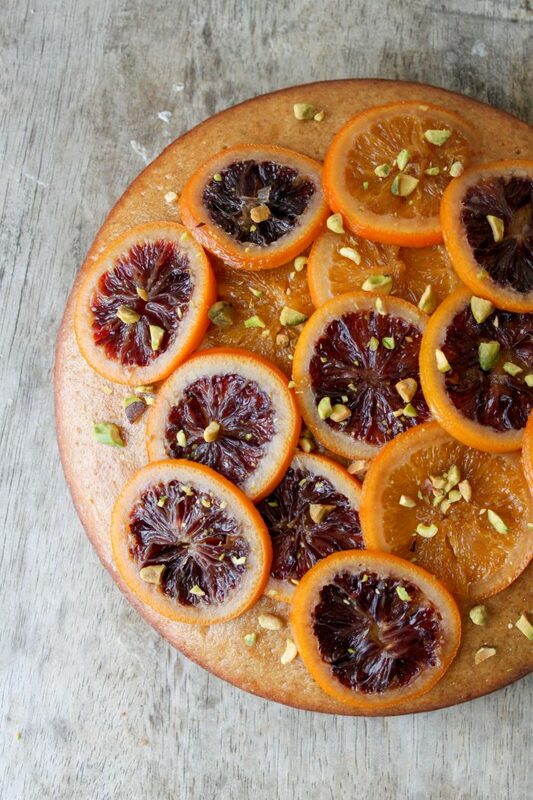 I need to make this cake…love candied orange! Yes! Please, do. And make extra candied oranges for snacking! I’m sorry for your loss. This is such a fast-paced life and I am like you where cooking is my step back from it. Your cake is beautiful and sounds delicious. This is going on my “to make” list. Thank you, Annie. Much appreciated. Hope you enjoy the cake! I thought about making it into an upside-down cake, but I wanted extra candied oranges for snacking! But I must try that next time. Thanks for the tip! Thanks for pointing that out! I have updated the directions.